Ongoing game of three colour go, started on the 1st of October 2003 and ended on the 6th of December 2003. 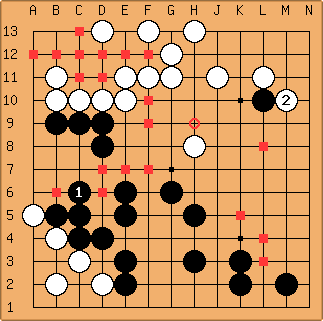 The game ends when all players pass (that is, after a sequence of three passes), when two players agree to resign or when all players agree on a draw. The final position. Result: B+Resign. B109: This is pretty big. If Red gets this point, he can later take the corner at his leisure. W110: Resigns. No point in continuing for me. I'm being attacked from two sides. Thanks for the game. David: That's a shame. Are you sure? Floris: Yes, sure why not? Araldo is 5 points ahead now his stones in the lower left have connected. And since ur not willing to work with me I have no choice but resign. Araldo: I think Floris is right, the game is over. Both of you, thanks for the game. And congratulations to David. David: This game was a great idea, Araldo. Thank you both for a stimulating experience. I'll admit to having had an advantage. 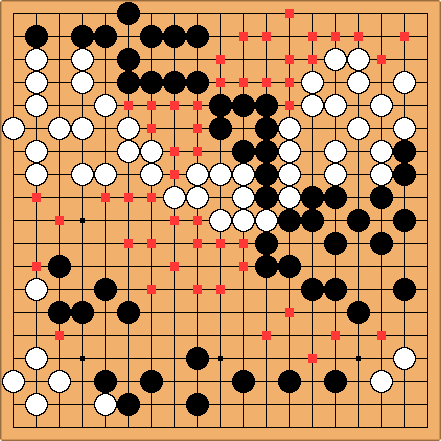 Before the game started, I had been working on a computer program that lets you play go with more than two players. This game gave me a reason to whip it into working shape, and it was immensely helpful in visualizing complicated three-color sequences. I used my program to generate a nice diagram of the final position, which is shown above. B106: If Red doesn't connect, I'll cut. However, since you make your decisions based only on the board, consider my other good reason for not messing with me: I gave you the first position, but I also have the power to take it away from you. It's your choice. I strongly suggest you leave the corner for now. B103: I don't think I can gain more in the corner. Red is able to kill White there, but in doing so he allows me to take the whole corner with a, so he shouldn't do it. 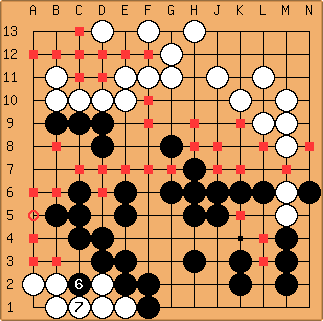 If I play a now, White gets back almost what he had before. As it is, White lives with reduced territory after a reinforcing move. Look at a position based on one I found while trying different things in this corner. 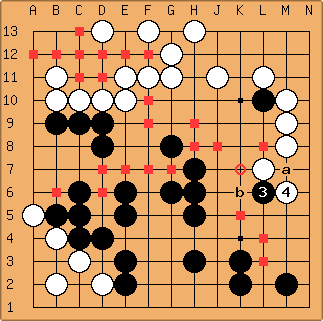 David: If Red now plays d (B3), I'll kill White and Red will be able to connect. I thought White would play d (B3) rather than , because then Red can't connect after killing, so he won't do it. c is bad for Red but bad for me, too, because it allows White to connect. R105: I have no other options but to (try to) kill the white group, to make a chance for 2nd place. d (B3) or b doesn't make a difference, I need David's help anyway. The main reason for letting me have the 2nd place is that I just helped you to take over the lead. : As much as I dislike rewarding the sneaky move of R99, this is good for me. Now White might be able to connect on the right, but that's worth fewer points than this corner. R102: I agree it is very close. I count 10 (6 for me, 16 for you) points more territory for you, but I also count 11 dead+captured stones more for you (3 for me, 14 white). So if I can get a few more dame points than you at the end of the game, I should become second. However, David may decide whether or not I will get those points, so I'm not sure this will happen. : Well, it seems Araldo would rather see David win than myself, and ofcoarse David agrees with this :) Oh well i'll continue on because second place isn't that bad... (Even if u guys kill my bottom left i am still second *grins*). R99: I was not thinking like that at all. 1) there is no possibility to attack David. Only you have got groups which can be attacked. Not much choice here 2) I believe I can become second with help from David. And David can become first with my help. If we kill the bottom left and David let me have sufficient points in this corner (the complete A column should be enough), than this will be possible. I believe you've made a mistake by not playing in the bottom left corner. : This keeps White from being able to wreak havoc by playing at a. It also gives me another threat I can use to help Red reduce White's territory. My count shows White comfortably ahead right now. HolIgor: I don't understand three way thinking but I wonder why black did not go for a kill. Can red help white to survive? Is it in red's interest to help white? David: It's because I didn't know I could kill. In fact, I was surprised that White responded. Of course, since your comment I examined the position more closely. Is this what you had in mind? (Here I assume that Red doesn't interfere.) This leads to a ko, which would be very hard for White to win, but which would also tie up Black and White while Red plays elsewhere. I think I would have played that if I had known it. This position looks like it would be common enough to be discussed somewhere; does anybody know where? unkx80: Not exactly this shape, but something similar. The closest I can relate it to is bent four in the corner. Anyway, this looks like a good opportunity for me to set another beginner exercises problem. See Beginner Exercise 154.
: Part of me wants to pursue a mutual damage strategy with a (A4), but I don't have enough confidence that I'll be able to produce a desirable outcome. : There are a lot of interesting plays now. R87: I'd never do this in normal go, but I think I can get away with it now. R84: I'm sorry David, but I don't think I have much choice. This is probably my last chance. David: No apologies are necessary. I wasn't that attached to those stones anyway. But aren't you being a little reckless? Playing at a would have made a second eye. (Or is there one there already, and I just don't see it?) I'm not sure there's an eye on the left after you and White capture the four black stones between you. Araldo: I know about the eye with a. I did this more reckless move because I think it is not sufficient for me to just make a living group (not enough points to become second). Possibly I can play a later. : I'll use the initiative while I have it to secure this wall. : I think this gives Red a chance of living, but he'll have to give up the lower right corner, which I hope to keep White from getting and keep for myself. (A little later.) As I look at the board more closely, I think that this was not such a good move. White a, Red b solidifies White's hold on the right side, possibly allows Red to connect, and cuts me off from the right. : made this move sente. (Red, but not White, has to respond or risk being cut. I guess you can call that sente.) Next, I plan to attack at a and b.
Floris: Hmm, well Araldo, looking at your stones, I do not think any of them will live, because they do not have a base anywhere, so I am guessing you will be third whatever the case. I don't think you have many options. The easiest for you is resigning (auto third, David and I would contine). Your next two choices are helping either me or David. I would probably be an easier target because of my B2 group that might be killable with the effort of two (David first, I second, you third). David really doesn't have much to attack, and reducing is not an option since your stones would die (no possible connection to any base). Another option is attempting to get help from either David or myself to make a living group, although this will be very hard, and the person helping will have to give up points so there's a chance for him to become second. Araldo: You are right, it is likely they will all die. Still, resigning for one person is not an option (not allowed by the rules). What I will do first is a few hopeless attempts to make two eyes anyway. After it is impossible to live, I will pass or make a few random or annoying moves, and see what happens. David: You have one eye at G8. I think the rules should allow one person to resign at a time. Araldo: I intentionatly left it out of the rules. This is because I believe it will severly spoil the rest of the game when one player quits before the end of the game. Obviously the first two options are better for me, so it will probably be one of these. David: It's desirable to finish second rather than third. Imagine that this is a tournament game, and the difference between second and third is the difference between advancing or not. 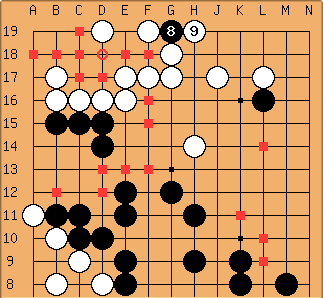 You'll probably have more luck attacking Black than White. Practically, though, I think you'll have trouble just surviving. Red is right in the middle of where Black and White want to expand. I especially want to kill you, because many of your stones would become my territory. : This narrows Red's lower escape route and aims at a.
David: I thought for sure you would play b. Oh, well. Araldo: It doesn't matter much for me, since I'm last place even when all my stones survive. Thanks anyway. : It looks like Red will have trouble making eyes in the center now. R63: Actually, making eyes in the center was never my intention. But now, connecting doesn't look very easy either. : I said I'd do it, so I'll do it. When I first thought of this position, I thought that White would capture immediately and force Red to settle the position, allowing me to rescue my B9 group. Now I think that White probably won't, and Red doesn't have to respond until he does. That leaves a lot of aji in the position. Saving Red makes the score more even between White and Red. The goal is to win the game, of course, and so I want to keep my opponents' scores about equal. Concentrating too much on one color allows the other to gain ground. If Red dies, White has three corners and a side, and will probably beat both Black and Red. R60: Thank you very much, David. : I'll save you on my next turn, Araldo, if you put up a fight. Here I'll take the free move that such a fight will allow me. : I don't think red can live anymore, not even if David helps because he is red AND white's opponent after, so his stones would die if they were surrounded by red, or by red and white together. 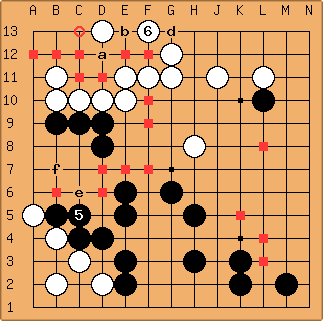 For example 'a' and 'b' are both illegal moves. Oh and Araldo, are you coming to the Martini Cup this weekend? David: What about Red at C11, Black at d? That's what I had in mind. The B9 group can easily escape anyways when you simply cut at 'e'. If red playes at 'f' however, it will die. Araldo was the one to launch the attack on you that caused ur B9 group to be endangered in the first place. Araldo: I also did not think of that. Funny, that only the "weakest" player noticed the solution. I guess Floris is right, there seems to be no good reason not to play e for David, and let me die. When this happens, I have clearly no chance to win the game, so in this case, my target will be to become second. This can be accomplished by helping one of you to attack the other. To put it more simple: I can decide the winner. If David plays e, it will be Floris. : This looks to me to have more potential than a reduction on Red closer to the center. R54: I expected , but unfortunately I cannot protect everything. David, can you do me a favour? Please play C13, to save my corner (I hope that is correct). In return I will help you with something you want. Maybe let you connect the B9 group to the rest, or kill the lower-left white corner. Your choice. David: I think it's interesting that you ask me to save you, when you could also ask Floris not to kill you in return for some favor. Araldo: Yes, it is interesting. Actually it never crossed my mind to ask Floris, but I'm not sure why. 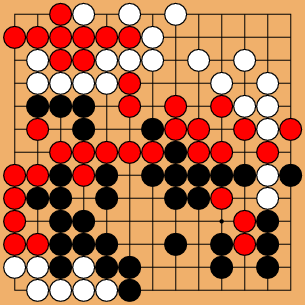 David: I did the same thing when I asked White to help block Red at move 43.
: I'm afraid this will strengthen Red, but it will strengthen me, too. R51: Oh no - Not another red target! : Thanks, Floris. I'll open up another front against Red. My idea is that we can both take territory while Araldo defends his groups. 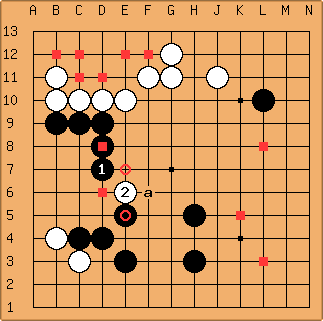 : With this move I hope to protect my group and get ahead of Red's push to the right. Some help from White from above would be helpful in keeping Red from connecting. a remains interesting. : I was tempted to try to trap Red with a (F7), but this looks too big to pass up. : This is awesome. Forget about trying to kill White. : Although i would like to atari at a, I am afraid red will endanger my group after he captures. R39: 'a' remains interesting. But I'd better strengthen a bit first. : I'll try to kill the white group, because a fight with Red looks like it loses my top group for sure while White takes territory. R36: Splitting attack! Anything else is boring. : It's hard to say which is the right move here. I've played through many possibilities, and this one seems to be the most promising. Depending on what happens, I may be able to connect to my group on top. Floris: Ok, I'm back. Let's continue. (Sebastian:) This is an interesting 3-color situation. : This is to prevent a white play at the same location, which would allow White and Red to cause pain on the left side. I think this is more important than trying to grab some more territory in the middle. Floris: Why play 'c' araldo? You'll only get yourself killed with c. Bad shape too. Also when surrounding stones, who gets to capture? The side to complete the capture? Araldo: 'c' is indeed bad shape and more dangerous for me. But it has some advantages: it creates a cutting point in your wall and I can run out if you don't respond. I admit it was not a great idea (E10 maybe more fun). The side to complete the capture, captures (duh). But there is no need to assign captured stones to the person who did the actual capture, since we will use area scoring (no need to keep track of the amount of captured stones at all). R30: I must be insane! Floris: Araldo, if you cut then i just capture the cutting stone in a net. Anyways, I will be going on vacation tommorow so most likely i won't play a next move. I will be a away for a week, so the game will be halted during that time, unless you guys would rather have someone substitute for me (which is fine with me). Araldo: Have a nice trip. Let's continue when you are back. : Here I try to keep a yet-unchallenged red group from expanding. I think that a play by me at a (C12) or b kills Red with help from White. 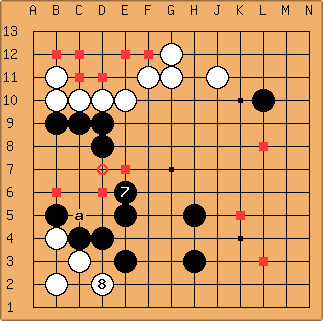 R27: seems a good move (at least in normal go). 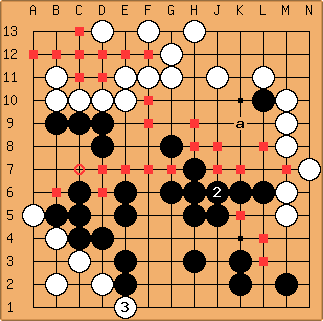 Now black has claimed about half of the board. Floris, I think we should do something about it soon. Don't you agree? To reduce the pressure on you a bit, I played R27, instead of c what I normally would do. This may give you an opportunity to recover a bit. : I hope I'm not being too timid, but I think this is necessary. It seems inappropriate to me to gang up against David, since he is the weakest player. But this may change when he takes a clear lead. It seems inappropriate to me to gang up against Floris, since he has the worst position on the board (at least in my opinion). I'm quite happy with the way things go at the moment. I don't know the reason for not ganging up against me. There may be an underlying system preventing unbalance. 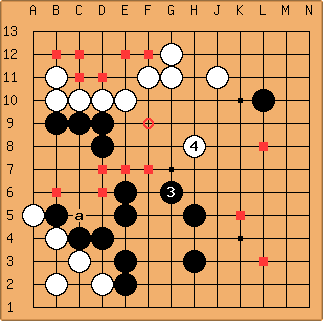 When there is one player ahead, then it is very likely the other two will cooperate to prevent him from winning. But when there are two or more leaders (like in this game until now), they probably prefer to strengthen themselves and trying to take the lead, instead of ganging up against one of the players (more effective). Maybe nobody wants to be the first to propose such a thing (doing that may work against you). 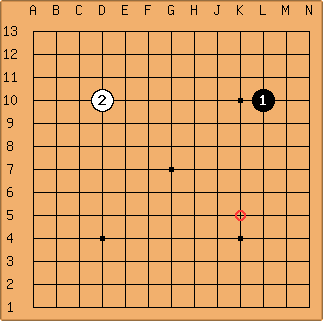 : This move keeps Red from playing at a ( ). If Red ataris from the other side, I'll capture at a. This seems like a safe way to take a little bit of territory. Araldo: Probably black would have played at a even without . R21: Let's see if I can make some living thing with this move. Normally it should live, but in this crazy game you never know. : I want to try to tighten up my connections, which are less secure against two opponents than against one. The situation at the upper left might be considered a capturing race. I thought about getting involved at a ( ), b or c.
R18: I feel a disaster coming for either red or white... and black may decide. : This is getting interesting! I'll block on the wider side and see whether White lives in the lower left or responds to the invasion at the upper left. : I'm not gonna explain my moves to my opponent :PP I'd rather wait until the end of the game. B10: This seems like a big point. I also thought of playing at a, but that struck me as too passive. R12: This feels a bit like backstabbing white. b seems like a good point too, but I think that is too harsh on black and brings the game out of balance. B7: I think that my stone at L10 can't live if both of you attack it at once (though there might not be much territory left in that corner after you kill it). I'll leave it alone for now and extend from my other corner, trying to face only one opponent at a time. 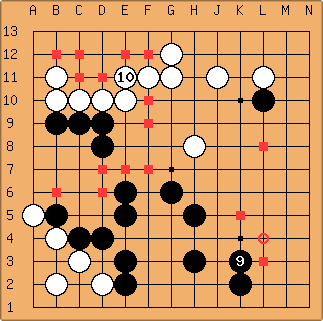 R9: Seems it will be a rather pacifistic game: let's all share the board in peace! B4: The first player in this game can get two corners. It's fitting that I'm the weakest player. R6: On the downside: since you have two corners you will be attacked first ... with a double approach! SnotNose: Or, if you only allow three moves per diagram, you don't need any special labelling for . Sebastian: Or to allow for 6.
numbered B and W stones and for new moves. Red writes coordinates in the side text. Araldo: I like the last suggestion best. Using letters is probably not a very good idea. David: Allowing only three moves per diagram is best. 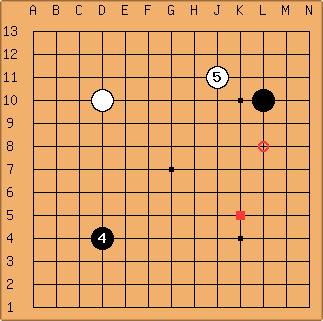 I think red moves should be marked with a square on an empty intersection (a circle on an empty intersection for the most recent move at the top). This is more visually distinctive to me and leaves to mark new white moves at the top. I have made this edit visible to let people know the game is starting. Floris?, on your turn you should change this page's type to OngoingGame. Araldo: The circle and square on an empty intersection are a bit too small for my taste. But we can at least try it for a while. 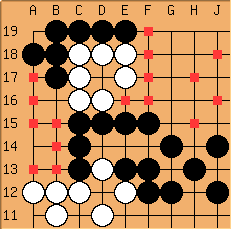 David: Another question is how to number black and white moves on the board. Let's try giving them the move number modulo 10 (with 0 becoming 10 in the diagram). This means that we'll have to change "$$B" to "$$W" and vice versa in each new diagram. Anonymous: Does't this affect certain life and death problems? For example, eyespace of 4 in a row is not alive. Also, wouldn't any game between experts end in a 3-way draw, because the two people that are behind would gang up on the leader? 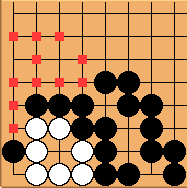 Now that I think of it, 4-color go is more interesting, with two teams of two. Uno : Looking at move #99, does it make sense to add this rule? A player cannot put the player who played before him in atari. Araldo: I don't like this extra rule. In my opinion, the beauty of three colour go is that such extraordinary things can be done. Almost anything is possible with teamwork. I like it this way. (Sebastian:) This is an interesting 3-color situation. Even if W and B team up against Red, the red hane (red ring) is a safe connection since and are of the same color. After and Red can take because it is suffocated by its ally. (Sebastian:) But of course - this works! So the following would be allowed? (Sebastian:) What if there were a Ko? Can capture ? This would not revert the board to a previous state. rubilia: Coudn't Red capture again? This connecting move seems quite strong (locally spoken). There shouldn't be a bigger play to Red elsewhere, because otherwise it would be bigger than the ko to (at least one of) B or W, too. David: Certainly. Even in a classic ko position like this one, Black and White may keep recapturing as long as Red is changing the state of the board somewhere else. David: Actually, that's not true. It would be true if we were using the situational superko rule, but we're using the positional superko rule in this game. Black has a big advantage in this position. 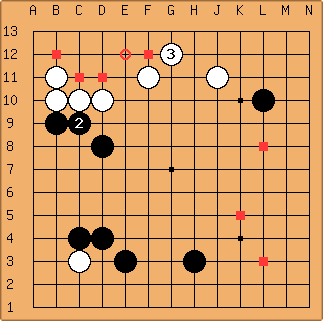 He doesn't have to make any threats because he may recapture whenever it is his turn (Red plays just before Black, changing the state of the board, unless Red passes). 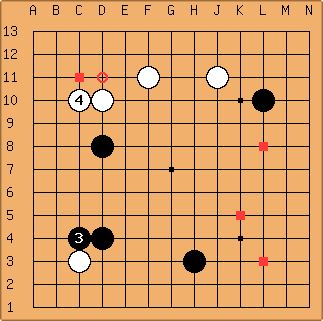 I don't know if a three-color ko position exists, where all three players want to play locally but are sometimes prevented from doing so because of the ko rule. (Sebastian:) Does anybody know if there are real red (or otherwise colored) stones available? Wouldn't it be fun even for a two-color game to play with different colors for a change? Araldo: Last weekend I saw people playing 3 colour go with plastic go-stones coloured red, blue and yellow. Together with normal stones they can be used to play 2-5 colour go. I don't know where you can buy them. David: With area scoring, points are removed from the captured player's score, instead of being added to the capturing player's score as in territory scoring. It doesn't matter to the score which player captures (though it may matter tactically). 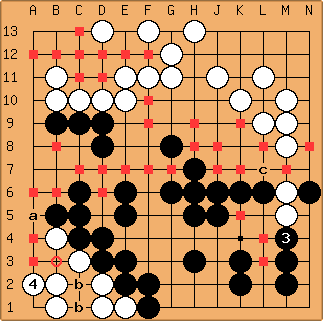 Dead groups partially surrounded by two players will probably be captured, because the other players want to maximize their score. There may exist positions where a group without eyes lives in something like seki, but I haven't thought of any for three players. Klaus: Seems to make sense, even in a game with more than 3 players. Araldo: Nice. I believe this is seki, but I think such sekis will often not last until the game is finished. At the end of the game, asume one player is in the lead. Let's call this player: X. Player Y and Z can capture X if they cooperate. However, Y and Z will probably only cooperate if they can benefit both. Also, Z can decide to capture Y instead, so this may lead to some interesting complication. rubilia: Here's what I thought when trying to construct the position: When Y breaks up the seki, the next moving player is supposed to follow up. (Except after White b16, wich Red can answer with a relatively small d17 only. 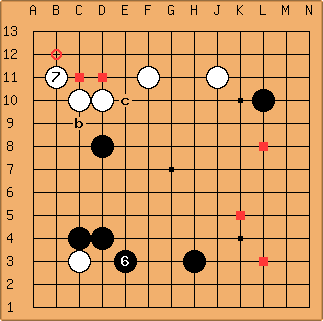 In this case there may be a hotter play to Red, and White will be captured by Black. Nevertheless, no colour then looses more points than White, either.) Y probably will start the attack only if it's better to the next moving player to eat the third one, one of which, consequently, looses more points than Y does. 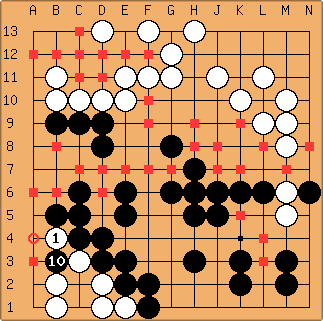 Since I've given 8 points to each colour in the above position, any attacking player would loose as much as the mutually attacked one plus one move. But now, I found that, if White is leading, Red second and Black only very few points behind, Black can play at b16 even when expecting to get captured immedeately by White. With some help of Black, Red is stopped from invading at e19, White will live, and finally, Red will get captured by Black a14 which secures 2 or 3 points to Black. So you are right, there might be some instabilities. David: How about this position? (The outside Black and Red groups are alive.) Black can't capture, because the area the Black stone is in acts like an eye for White; Black can't fill it without suicide. If White captures he's left with no eye space. 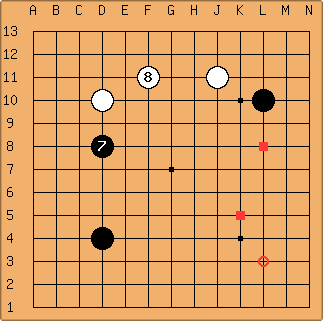 If Red captures, White makes two eyes, gaining points for White and losing points for Black. No one can gain anything by capturing, except that Red can capture as a ko threat. rubilia: Similar to the position above, even this one can be unstable in some special situations. 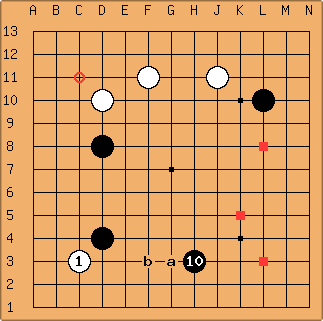 The inside-seki score (black:white:red) now is 1:8:0 (or 1,5:8,5:0 if shared points count only to the adjacent colours, partially). After R at A1, B tenuki, W at A2, the inside score is 0:10:0. So, at the very late end of the game, playing A1 should be quite useful to R if he was only 1 point behind B (at whole board total score). Iago: i'd like to try that, who wants to play a 3 color game with me (kgs 9k) ? Celebrir: I would like to play a 3-colour game too. Anybody else ? Cliftut: I'd like to try it out. I suppose we would need to start a new page. will we call it "Three Color Ongoing Game 2"? I really think a page should be set up for organizing 3-color games.